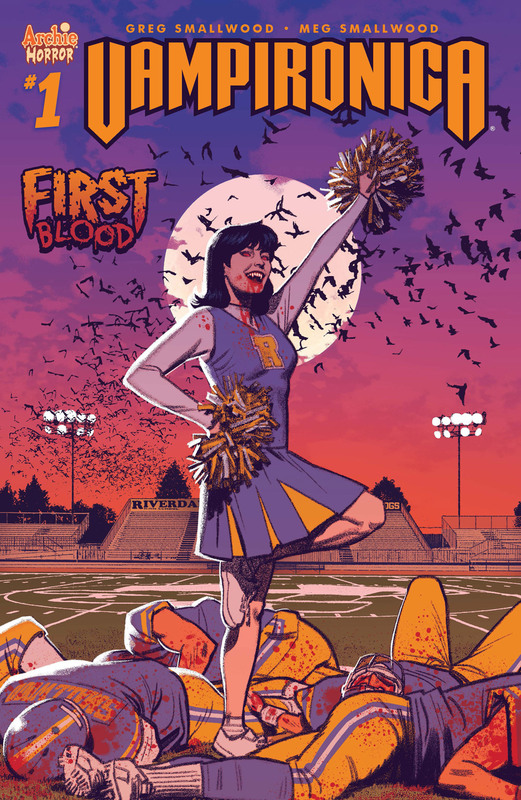 When Veronica gets bitten by a vampire, it's up to her to defend Riverdale from the undead if she can just keep her bloodlust under control. One of the most consistent lines from Archie Comics has been its Archie Horror imprint. 'Afterlife with Archie,' 'Chilling Adventures of Sabrina,' and 'Jughead: The Hunger' have been genuinely suspenseful and great non-continuity world building. Archie adds to their line-up with another hit in 'Vampironica' featuring Veronica Lodge as their own version of Vampirella sans the skimpy outfit. The story is straight-forward without much backstory in issue one. The opening scene shows Veronica already in Buffy-mode when vampires attack at a pool party. It's a great looking and designed scene that ends with Ronnie emerging from the pool dragging two bodies. Creators Greg and Meg Smallwood set the tone early and the issue is off and running from there. The pace is breakneck from there and Greg's fluid layouts and dynamic designs create an entertaining flow of suspense and peril. Greg's design of Veronica, in particular, is a contrast of personalities. Her features are more rounded, softer, like a cherub, in a Phoebe Cates sort of way. But when she's lusting for blood or attacked her eyes go red and the fangs come out. There's very little time to question things but by the end, you just want to keep reading to see what happens next. 'Vampironica' is the Archie-fied vampire series we didn't know we needed. Greg and Meg Smallwood have created a slick fast-paced bloody adventure that is hard to resist. It's unabashedly Buffy-meets-Vampirella-meets-Riverdale and a great new starring role for Veronica to shine. Archie Horror hits another home run adding a stellar vampire story to its universe of zombies, witches, and werewolves.